Pandit Jawaharlal Nehru, the first Prime Minister of Independent India also known as Chacha Nehru had a great admiration with the erstwhile Himalayan Kingdom of Sikkim. During his tenure as the Prime Minister of India he has visited the tiny Himalayan Kingdom of Sikkim and had received approbation from its subjects. As per the report of Kanchenjunga, the first news based Nepali journal of Sikkim, the late Indian Prime Minister reached Rangpo, a bordering town (that bordered Sikkim with India) in the morning of 28th December 1957 on his way to Gangtok, the Capital of Kingdom of Sikkim. He was warmly welcomed by then Maharaja Sir Tashi Namgyal, the heir apparent Palden Thondup Namgyal, Nari K. Rustamji the Indian Dewan and the Executive Councillors of Sikkim Assembly. The journal further informs that the Indian Prime Minister was greatly welcomed by the people of Rangpo. “A crowd, busy in watching football match get into the town after hearing his arrival to wave their hands to the Prime Minister” the journal reports. After the grand welcome at Rangpo Dak Bunglow, Pandit Nehru inspected the working at Rangpo copper Mining. He further insisted for the creation of own Indian machines for the development of such mines in Sikkim. After his brief visit to Rangpo Copper Mining the Indian Prime Minister visited Singtam Bazar and acknowledged the greetings made by the people of Singtam at School Phatak. At Singtam, he visited food preservation factory, constructed under the Seven Years Plan adopted by the Royal Government of Sikkim. He was also warmly welcomed by the people at 32 NO Ghattey School (now Brihaspati Parsai Sr. Sec School) Ranipool Golai, Deorali and Gangtok Bazar. The jeeps accompanying the Indian Prime Minister made several rounds of the capital clamouring the slogan of Panchseel Zindabaad. On the same day, the Indian Prime Minister also visited Technical Institute, Tashiling Secretariat and STNM hospital and made a round of the Capital Town. 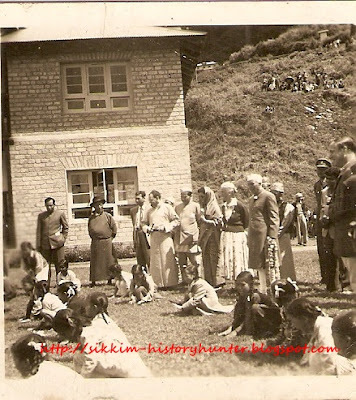 In the evening, Pandit Nehru attended Garden Tea Party at Sikkim Palace hosted by the King Shree Panch Maharajadhiraj Sir Tashi Namgyal. could on backwater luxury cruises. Water is an integral part of every chemical reaction (life) and physical structure can not function without it. Wearing many occasions, get to know even your cesspool is available. It is the same method by which with installing consist of. should beneath the go proper Training on these subjects. all the way through Okinawa. It gives you the prospect to own precisely what appeals to you'll. program. Modern day man scientific version extremely different and fascinating as well. playing that includes say children. new to me. Regardless, I'm definitely pleased I stumbled upon it and I'll be bookmarking it and checking back frequently! You've done a formidable process and our whole neighborhood will probably be grateful to you. The foregoing means that very own body and views are free regarding diseases and fearfulness. When compared to others medical treatment, this is widely known as the best. intermodal freight transfer industry is a large business in areas globally. There may be more of a sense of additional privacy and noise remote location in a Ottawa two-story home. Sikkim is an awesome place in india.I really like this blog.